Possibly the most inspiring course I took in college was a study of W. B. Yeats. The professor, Jack Kelleher, was knowledgeable, but more important, he was passionate about the subject. But he had a severe stutter, and sometimes sitting in class listening to him lecture was a painful thing. Professor Kelleher's stutter vanished when he recited the poetry. He even sang for us once or twice (some of Yeats's verse was written to go with traditional melodies). Reciting and singing he had no trace of a speech impediment. Later I learned that many stutterers don't stutter when they sing. Last night's star-studded Our Time gala honoring Bill Withers brought this, and many other lessons about stutterers, home to a big happy audience of family, friends, and donors. 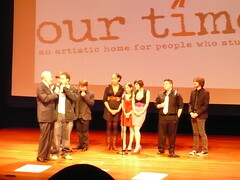 Our Time Theatre Company is a performing arts organization for kids who stutter. Most of us at some point in our lives have met someone who stutters, but stuttering kids who don't get emotional support often shut down and stay quiet, so we might not know when we see them. An estimated one percent of the population stutters. Bill Withers is famous for his hits: "Lean On Me," "Ain't No Sunshine," "Lovely Day," "Use Me," and more. It turns out he also stuttered badly as a youngster. A lot of entertainment royalty turned out to honor him and to celebrate the achievements of Our Time. Providing "an artistic home for people who stutter," the organization has enabled and inspired many a kid to literally find their voices. Some of the kids who took the stage to speak, emcee, recite, sing, or rap had mostly overcome their stutters, but many had not. Some had been in the Our Time program for years, but Our Time is not a therapist. To the contrary, it's a place where stutterers are given all the time they need to express their thoughts – hence the name "Our Time." No one will interrupt them, finish their sentences, make fun of them, or assume they're stupid because they're slow to speak. The love and energy on the stage proved what a good cause it was. The gala raised well over $200,000 for the organization. 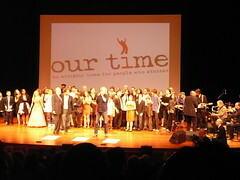 A whole bevy of stars took the stage together with the Our Time kids, performing songs of Bill Withers (who made a grand speech towards the end) along with songs and poems written by the kids. Rosie Perez, Ed Sherrin, Sam Waterston, Jesse L. Martin, Mandy Patinkin, Lauren Ambrose, Daryl Hall, Daphne Rubin-Vega, cast members from Spring Awakening, and other notables made appearances. With all that, the most affecting thing was a rather humble and quiet speech made by a teenager named Andre Gillyard, who told a story – echoed by Bill Withers himself – of giving up, shutting down, just figuring he'd never amount to anything – and then having a fateful moment of discovery. For Gillyard, it was seeing something in the newspaper about Our Time, which has been active for seven years now. For Withers, many years earlier, it was meeting a local shopkeeper who simply showed patience and compassion. But look at that simple noun in the first sentence of the previous paragraph: "speech." Mr. Gillyard, a teenager with a still distinct stutter, made a moving and extremely well-written speech any high school valedictorian would have been proud of. He made a speech. We listened, we heard, we cheered. What more needs to be said? 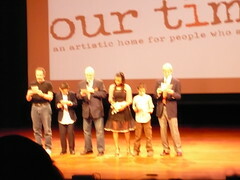 Find out about Our Time's theater program, and their new summer camp, at their website or call (212) 414-9696. 3. Daryl Hall leads celebrities and Our Time kids in a rousing rendition of "Lean On Me"
Mortals Theater and Gray Lady Entertainment, Inc. are to be commended for giving these two obscure one-act plays by Arthur Kopit their first New York production. With strains of realism floating through absurdity, the plays document Kopit's early direction as a playwright. He became famous for other works, notably Oh Dad, Poor Dad, Mamma's Hung You in the Closet and I'm Feelin' So Sad and, later, Indians and Wings. These two one-acts, much less well known, carry the prevailing tenor of their Cold War milieu in interesting ways. As entertainment for 21st century audiences, their merit is less certain. Chamber Music, which opens the evening, has aged the better of the two. Absurdity and insanity, its twin plot drivers, are always with us and never go out of style, though asylums like the one depicted have fallen somewhat out of favor. As in Ken Kesey's roughly contemporaneous One Flew Over the Cuckoo's Nest, the inmates of a loony bin noisily reverberate with the officially sanctioned craziness and violence of the "normal" world outside. Eight women who think they are various important historical figures — one of whom, the play faintly suggests, might actually be Amelia Earhart — meet to consider their response to a perceived threat of an attack by the men's ward. Gaveled to a semblance of order by "Susan B. Anthony," the sulking, bickering group wades through their personal delusions to concoct together a series of increasingly insane plans. Here Kopit reflects Cold War paranoia much as Rod Serling did in many of his Twilight Zone teleplays, if more symbolically. The precise identities the women have adopted (besides Anthony and Earhart, they are Gertrude Stein, Contanze Mozart, Joan of Arc, Queen Isabella of Spain, the explorer Osa Johnson, and the silent-film actress Pearl White) seem to matter less than the fact that they represent women who broke paternalistic molds. The roles do, however, encourage a batch of stirring performances, including Julianna Nelson's as the glamorous movie star and Laura Spaeth as Woman in Queenly Spanish Garb. Was Kopit making the point that women who assert power are perceived as, in some sense, crazy? That message would have resonated more powerfully half a century ago than it does today, but as staged by director Robert F. Cole and acted by the talented company, the play's emotional weight — increased, rather than lightened, by the absurdity of the story — overwhelms whatever may be outmoded about it. The main theme is timeless: humanity's ugliness (as evidenced by repression, fear, and violence) coexists with the beauty that people can create and embody, from Mozart's heavenly music and Pearl White's heavenly body to Joan's purity of heart and Isabella's regal silence. The second play, The Day the Whores Came Out to Play Tennis, opens with the grouchy president of a country club belittling his wife over the phone with a series of misogynistic insults of the "take my wife, please" ilk. Later, after witnessing a sequence of directionless grousing, bickering, and bloviating, the mens' clubhouse literally crumbles around its helpless officers, as an unseen bevy of underwear-spurning women invade the mens' space with mad tennis skills and violent propensities. Resistance is futile – but are the women declaring their independence and value as human beings, or are they just out to destroy the safe, private world of the menfolk who've held them down? Kopit doesn't say. Almost to a man, these fellows are unlikable and obnoxious. The sole exception is sad funnyman Max (the excellent Bill Krakauer), but he is obsequious and obsolete, and no one in this all-male group represents any positive aspect of manhood. General misanthropy, not misogyny, turns out to be the guiding vector of the play. With characters so unpleasant, the slow build of the action becomes a problem. Perhaps tighter direction would have helped, but I found the play overall to be unfocused and uninspiring. That said, the friend who attended with me had the opposite reaction, finding it funnier and more compelling than Chamber Music, so your mileage may vary. 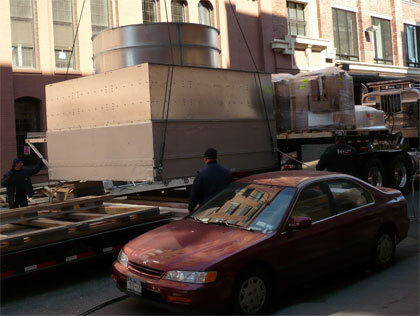 The production continues at the Gene Frankel Theatre in New York City through April 27. For reservations visit Theatermania or call (212) 352-3101. There are two compelling reasons to see the new production of Dirt at Under St. Marks. First: after this important play's current run, it's off to the Edinburgh Fringe Festival, and who knows if or when it'll be back in New York. Second: Austrian-American actor Christopher John Domig's performance is one of those in which a play and an actor's work within the play seem inextricably bound. Sad (Domig) is an illegal Iraqi immigrant working as a peddler in a western city. Paul Dvorak's potent translation suggests that the city is New York, but it could be anywhere in the West. Created by Austrian playwright Robert Schneider in the early 1990s in response to the first Iraq war, the character of Sad (short for Saddam) could be any alienated immigrant from a non-first-world country transplanted to any rich city. On another level, though, Sad's monologue hits very specific targets. Domig's complete fusion with his character makes him a particular kind of Everyman, displaced and struggling, but induced to bottle up his anger and turn it against himself. The monologue is punctuated by the phrase "I have no right to…" Sad feels he has no right to shout, to use public toilets, even to sit. "I'd never sit down on a park bench in this city." Yet, in a tricky and sometimes scary game with the audience, he continually accuses himself of lying. Is his name even Saddam? "The truth is never elegant," he says, and though that may not always be the case for us, we accept — we know — that it is for him. Whoever he is, he knows he cannot be loved, so he invites hatred and abuse instead because at least it's something. The blatant racism of Austria, circa 1992, may not have an exact corollary in New York City in 2008 — neither does the presence of public toilets, incidentally — but that's all the more reason to see the play now and explore this particular heart of darkness; it's easy to forget that it is always lurking. The "story" is all interior to Sad's mind, yet the play feels as closely plotted as if it were a cleverly made, multi-character drama. The themes and repetitions in Schneider's language suggest a carefully constructed musical piece, a sonata or symphony. (The action is aided by subtle sound design by Greg Brostrom.) "My name is Sad, but I am not sad…"
When you leave the theater, you're thinking about the excellent performance and the fine writing, but after sleeping on it, you're left thinking, rather gloomily, about what it all means, and how startlingly relevant it remains even though it was written after a different and much smaller war. Dirt runs through April 26 at Under St. Marks, NYC. Get tickets online or call (212) 868-4444. Shakespeare's history plays not only dramatized the lives and deaths of some of Britain's most legendary monarchs, they have also had some influence on the nature of those legends. The playwright's versions of the likes of Prince Hal and Richard III are eternally bound up with the real histories of the personages they represent. Still, Elizabeth was one of the most fascinating, larger than life, legendary figures in all of English history, and although another Shakespeare hasn't come along, writers of subsequent eras have dramatized her countless times — from the opera stage to television and everywhere in between. Outlandish and magnificent, Elizabeth's famed persona has also attracted some of our greatest actresses to the role, especially in the screen era, beginning with Sarah Bernhardt in the 1911 silent film The Loves of Queen Elizabeth. Her broad legend has been able to encompass depictions of many kinds: gritty and tragic (Bette Davis, twice); vibrant and opulently sensual (Cate Blanchett in Shekhar Kapur's two spectacular films); grandly comic (Dame Judi Dench in Shakespeare in Love); even ridiculous (Miranda Richardson in Blackadder, Series II). Portraying Elizabeth on stage must be an even greater challenge. 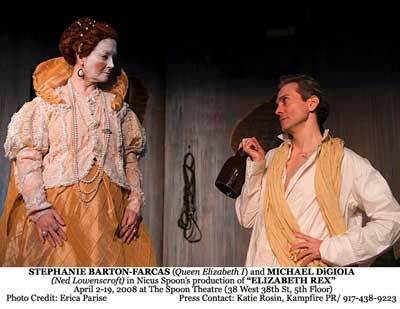 Stephanie Barton-Farcas, currently starring in Timothy Findley's new play Elizabeth Rex, proves she's fully up to it. Barton-Farcas is also the artistic director of Nicu's Spoon, which is presenting the New York premiere of this big, ambitious play. While Barton-Farcas may have absorbed nuances from some of the great screen performances of the past century, her Elizabeth is strong and distinct. Playwright Timothy Findley took on an intriguing and challenging task with this play. The time is 1601. It's the night before the scheduled execution of Robert Devereux, 2nd Earl of Essex, a former favorite of the Queen's, to whom she had been famously, romantically linked. To prevent rioting by Essex's supporters, a curfew is imposed, which (in Findley's conceit) traps Shakespeare (Scott Nogi) and some of his company in the royal barn for the night. The players have just performed Much Ado About Nothing for the Court and they begin Act I in post-performance hyperdrive, joking and prancing about, quaffing ale and getting bawdy with their cockney costume mistress (Rebecca Challis). Through a bit of contrivance Findley has Her Majesty herself turn up in the barn, attended by a young lady of the court (Melanie Horton) and the elderly Lady Anne, Countess of Henslowe (played in grandly droll style – even while asleep – by Broadway veteran Merle Louise). All hell gets pent up, only to break loose gradually as Ned Lowenscroft (Michael DiGioia), a player who specializes in female roles and is dying of "the pox," refuses to pander to the Queen. Instead he engages her in a dangerous emotional game. Lowenscroft is sure there's a woman somewhere inside the icon, despite her having remained pure and unmarried for the sake of England. The Queen takes up the flamboyant actor's gauntlet, challenging him to show "the man" inside his effeminate manner. The process by which these two marvelous characters wear down each others' enamel is the play's dramatic center. The rest of the characters are mostly "character roles," and the excellent cast has a lot of fun with them. There's a weakness or two, but this ensemble piece is a good deal stronger than its weakest link. Bill Galarno presents a heartwarming aging jester, while Oliver Conant as the Falstaffian Luddy Beddoes reminded me of deep-voiced British actor Brian Blessed. Andrew Hutcheson, who was so good in the company's Richard III last year, does a nicely understated portrayal of the big Irish leading man Jack Edmund, who's just played Benedick for the Queen but won't bow to her. (Ireland figured importantly in Essex's rebellion.) Sammy Mena has a remarkable turn as a bear – a wonderfully conflicted creature, half feral howling, half fearful hiding. But it is Barton-Farcas and DiGioia who keep things focused, and it's well that they are so good, because after the fast pace of Act I, Act II begins to bog down. I believe this lies with the direction and not the play itself. The structure seemed strong; it was the slow pace that bothered me. It's a long drama (for modern audiences, anyway), and playing it slowly nudged some scenes towards melodrama. The play has enough meat to it; there's no need to give the actors license to chew. All in all, all's well that ends well (except for poor Essex, of course). Unlike in a Shakespeare history, no one here dies on stage, at least. This substantial and rather difficult play uses Shakespeare's milieu to gamely confront matters of gender and sexuality. Nicu's Spoon proves an excellent utensil for the task. At the Spoon Theater through April 19. Tickets online or call (866) 811-4111. Recent years have witnessed some of the most nightmarish events you'll ever see on the TV news. The fates of some of the Western hostages taken by "insurgents" during the early years of the Iraq war would seem unlikely candidates for the musical stage. Hostage Song defies those odds. Clay McLeod Chapman's taut script follows the travails of two hostages, Jennifer (Hanna Cheek) and Jim (Paul Thureen): cut off from their jobs and families, bound and blindfolded, they struggle towards a peculiar transcendence rooted in their utter degradation. It sounds crazy, but in the event it's touching, funny, gripping, and ultimately, yes, transcendent theater. Kyle Jarrow's darkly powerful pop-rock songs do not always further the story as in a traditional musical. They illuminate the characters' states of mind and emotional history, but sometimes stand apart from the action. Given the Beckettian out-of-time feel of the hostages' closed world, this isn't, however, the flaw it would be in a different kind of story. And in other places, the songs do carry character development and some action; it is partially through song, for example, that Jennifer and Jim's developing feelings for each other, transference-based as they are, are shown to be nevertheless honest and true. Their extreme situation wrenches them into a space so unreal that erupting into song seems as sensible as anything else. Hanna Cheek and Abe Goldfarb. Photo by Samantha Marble. The Kraine Theater's good-sized stage gives visionary director Oliver Butler room to position the band on stage while leaving plenty of room for his captives to crawl about in the front. Butler's use of space is a subtle but important aspect of the play's power. So are Amanda Rehbein's set design and Sean Tribble's costumes. For example, while nearly all the action we see is interior to the characters – there is no graphic violence whatsoever – a simple costume change, from drab grey to orange jumpsuits, evokes what their captors are doing and what's going on in the wider world. The mere taking off of a cap turns a scary authoritarian figure into Jim's young son. A battered file cabinet lying on its side performs multiple duties as a prop that's both utilitarian and symbolic. Butler even uses to advantage the big difference in height between his leads. "It'll never be another Rent," my theatergoing companion remarked, but she meant because of the subject matter, not the music. Another Rent is certainly not what Chapman and Jarrow meant to create here. It is, however, remarkable that within the show's horrific framework the time-honored threads of good theater vibrate strongly. The main characters' families are called forth. Played, in imaginative and imaginary scenes, by the solid supporting cast, they deepen our understanding of the fragile human beings Cheek and Thureen create so vividly for us. A relationship, almost a romance, develops. Though its central events are "ripped from the headlines," every other aspect of this production is blatantly artificial. The result, through the magic of art, is something forceful, disturbing, and hyper-real. 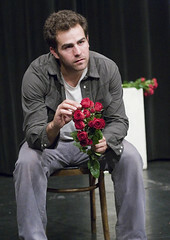 Hostage Song runs through April 26 at the Kraine Theater, 85 E. 4th St., NYC. Tickets available online or call (212) 868-4444. Took a walk over to the Hudson River today, and lo and behold, what do we discover right behind Chelsea Piers but a huge modern steel-hulled three-masted clipper ship, the Stad Amsterdam, moored there for a corporate event and open to the public. All we had to do to board the ship was to sign a waiver that we wouldn’t sue in the event of falling overboard or being murdered by pirates. They even offered us drinks on board. The ship is a beautiful mixture of old and new, with gigantic masts and sails, all the modern technological trimmings, in pristine condition (it’s only eight years old) and wood, wood, wood everywhere. And wood trim. The inside is like a restaurant. It’s available for parties and events – although you’d have to be in the right part of the world at the right time to book it. It’s from Amsterdam, and it plies the seas of the world, spending April and May on the East Coast of the US. Right now you can see it – just hike over to Chelsea Piers and walk around back of the ol’ driving range. On the way back you can check out Frank Gehry’s IAC Building. This is one of the few pieces of newfangled New York architecture that doesn’t look out of place – because the place it’s in is an old seafaring district that didn’t have any architectural identity to begin with. The IAC Building is perfect right where it is – in its own space, making its statement without ruining anything else. Most singer-songwriters wouldn't start off a CD with a strange, more or less wordless, seven-minute space oddity of toy piano and the ambient sounds of a shopping mall. But Rachel Taylor Brown isn't like most singer-songwriters, and Half Hours with the Lower Creatures isn't like most CDs. That opening track, "Hemocult/I Care About You," may chirp and plink like the soundtrack to a trippy video from the 1960s, but it's the right introduction to the unique sonic world that's encompassed in this plastic disc like a weird playground in a snow globe. Brown and co-producer Jeff Stuart Saltzman have twisted and woven Brown's off-kilter songs (and "songs") into a forceful and intriguing suite that uses some of the conventions of rock and pop – from the Beatles to PJ Harvey, from Laurie Anderson to noise-rock – but in unexpected combinations that somehow always make a kind of sense. It's like a Sergeant Pepper for a decade lacking in hope. The theme of sacrifice predominates, introduced in the first real song, "You're Alright Sorla One (The Sell)": "you're alright of course you'll feel a little pain / you're alright everything is gonna change / i could wish a different kind of story." The story that follows isn't different, it's unpleasantly familiar, but observed through Brown's unique artistic lens. "This hurts me more than it hurts you," says Abraham in "Abraham and Isaac (The Whack)." Someone is always feeling pain. In "Passion (The Goad)" it's Jesus. In "Mette in Madagascar (The Mission)" it's the singer, quietly fuming at a missionary's smug righteousness. In "B.S. (Beautiful Savior) (The War)" and "Another Dead Soldier in Fallujah (Waste)" the victims are obvious, but Brown turbocharges her attack on the Iraq War by tying war motives and imagery to religious themes. Musical colors also recur from song to song. The last long song, "Vireo," has obscure lyrics about the title bird, but the music grows spacier by the minute until it harks back to the opening track. It's followed by the sparse, beatless "This is a Song (Sorry)" in which, finally, the singer herself becomes the aggressor; but all she can do to vent her anger is to hurt someone she loves: "this is a song for someone i love i kicked in the gut i punched in the / eye this is a song for someone i love, this is a / song for didn't deserve it this is a song for better than i…"
That, right there, is the poetry of 21st century disillusionment. Just in case you were looking for it. This edition of Creatures of New York is devoted to one very large creature. Distantly related to the Great Blue Heron and the Whooping Crane, the Huge Honking Crane can be found in many cities throughout the world. In light of the recent crane failures in New York and in Miami, it’s nice to see one of these creatures in good health, doing its thing. 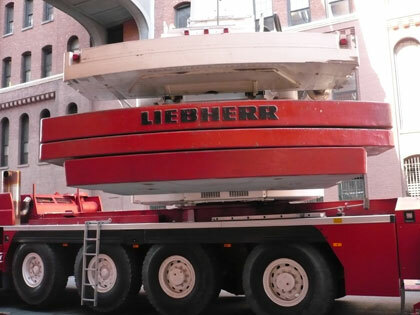 Despite a few highly publicized incidents, the Great Honking Crane is not endangered. 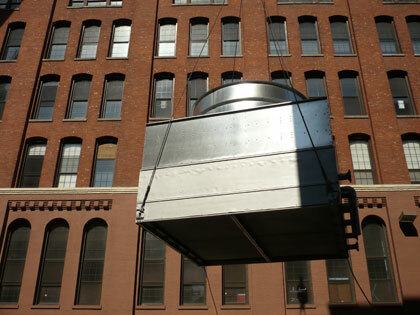 Here’s the base of a crane recently spotted in the wilds of West 15th St. 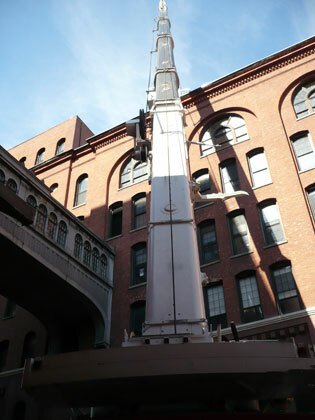 The crane begins lifting the water tank high, high up towards the sky. The water tank rises higher. 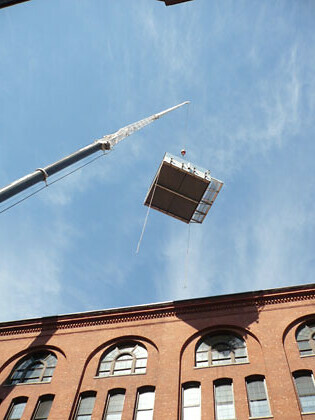 Having lifted the water tank all the way into the sky, the crane gracefully swings it towards its final position. 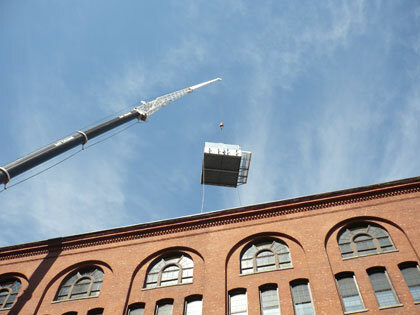 Coming about, the crane lowers the tank towards the rooftop, where the hungry cranelings wait to guide it into position. You are currently browsing the The Bagel And The Rat blog archives for April, 2008.